Blog - 2018 Silver Eagles. In Stock @ $2.49 Over Spot! 2018 Silver Eagles. In Stock @ $2.49 Over Spot! It's always exciting when new products come out, but the arrival of a new Silver Eagle is one of the biggest events in the bullion marketplace. Each January, collectors and investors worldwide rush to own the newest Silver Eagle release. 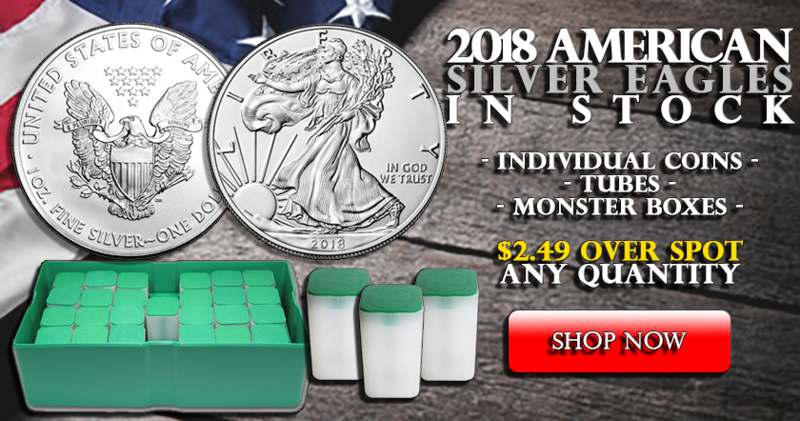 To prepare for this wave of demand, the U.S. Mint suspended production of 2017 Silver Eagles a bit early last year so they could focus on the 2018 issue. Knowing this coin would be a hot item, We've secured a large allocation of 2018 Silver Eagles from the first U.S. Mint release. We were able to negotiate a great rate, which allows us to offer these ASE to clients at the industry's lowest price. Your cost is just spot + $2,49 for any quantity! Simply put, we want you to get your coins first AND at the very best rate. We were fortunate to get a great rate on the first group of 2018 Silver Eagles, but we may not be so lucky on our next shipments. Be sure to take advantage of this superb wholesale rate -- while these remain in stock!